You MUST meet the clan requirements before you are allowed to go to the trips. If you wish to join MM we need you to come on a test run to know if you are truly Mayhem Maker material. When you come to the events take screen shots of them and post them on your application. need help with any of this go into #Mayhem-Makers IRC channel and PM an operator and ask for help. Pink Team-6 Cape is required for all trips( You can find the seller at Edgeville by wilderness ditch ). After you have posted your application the leaders will post feedback on your application and tell you what to improve. Simply post your improvements on the topic (do not only edit them in, but feel free to both reply and edit). if you feel it necessary you may PM any/all leaders on IRC to inform them that you have updated your application. When it is time for a trip you should show up 15-30 minutes before the set leaving time, find a leader ingame, pm the link to your application to that leader on IRC and he will invite you to the clan chat. Get on TeamSpeak (server address is ts.mm-rs.org), once we have started the trip we will kick non-members from the teamspeak and all applicants/intros will be required to say their TeamSpeak nicknames in the ClanChat to be moved into the right teamspeak channel. During your time as an applicant you may be removed from the clan chat after an event, this does not mean that you have been declined or kicked, it simply means that you are not accepted yet and that you have to keep improving your application and showing up to trips in order to be accepted. As you attend events post pictures of you at the event on your application, you need at least 3 different events to be accepted. Remember these requirements are the absolute minimum to even be considered for MM. In order to be considered, your account must be quested. Quests we are looking for is Mith gloves, Desert treasure, and Having completed Horror from the Deep. Copy this form and paste it on your application and then fill it in. Please put your information outside of the, or any other tags. Hello, I would like to become a Mayhem Maker! What is your current Display Name? What are your current stats? The picture must show the entire RS screen. What is your combat level ? What quests have you completed (MM,DT,Mith gloves, etc) ? Where did you find out about MM (eg. MMTube, Pk Videos, In-game)? Where are you from and what is your time zone? If you are uncertain of your time zone you can check it HERE. At what time are trips for you, personally? You can check the trip times here. IRC is a REQUIREMENT to join. Please provide a picture of you on Swiftkit IRC or mIRC (To download Swiftkit click HERE ) in the #Mayhem-Makers channel. Also give us your IRC Nickname(s). Do you have any clanning experience? If so, in which clans have you been before also explain why you left them. 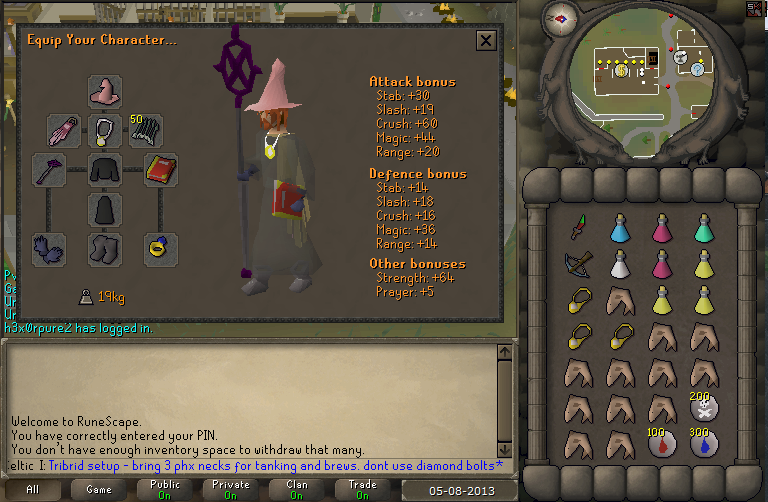 Show us a picture of your return gear set up in your bank. Note: You do not need to show us dozen of return sets. Forum activity is very important and you are REQUIRED to check the forums at least once a week. If you fail to check the forum within 2 weeks you will be kicked, do you understand this? 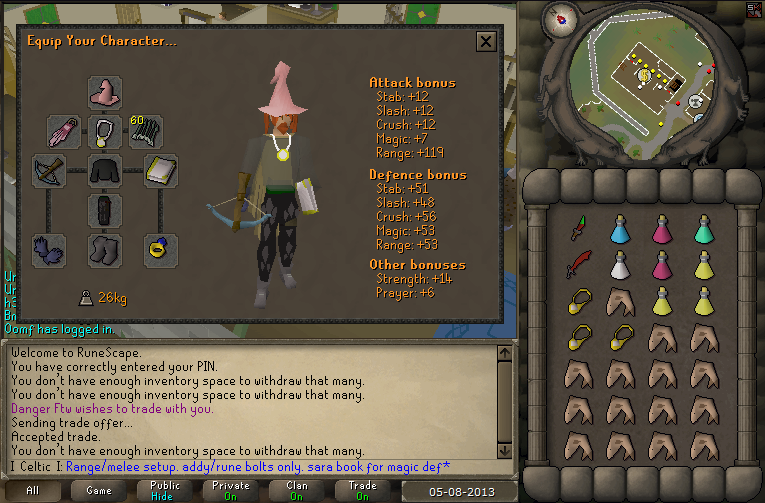 Mayhem makers is a pking clan after all, please provide us some pictures of pks you've gotten. The Mayhem Makers have a set of rules which you will have to abide with. If you don't you will be kicked. Have you read our rules? - No trip-skipping - if you are online while a trip is going on, you must go to it. - No teleporting using a Ring of life/Glory/Combat bracelet/Games necklace or any other jewellery. - No teleporting using other devices. "Have you read the rules?" please put: "I actually read the rules!" so we know you did. 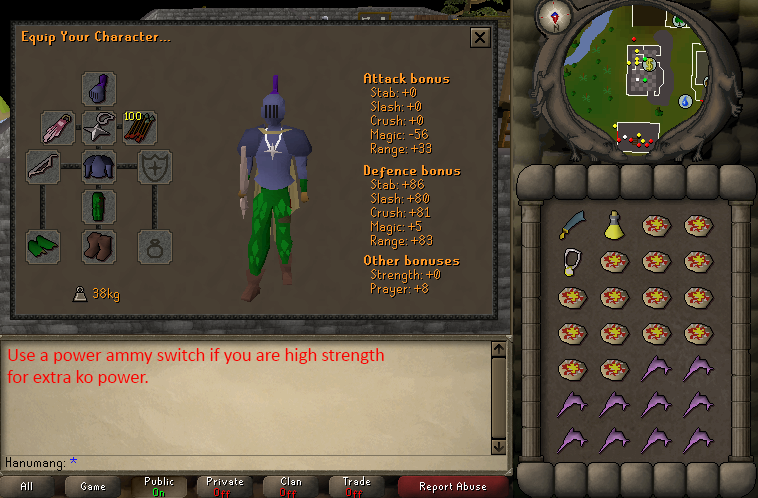 When you arrive at dummies find a rank/leader to invite you to the clan chat and join Mayhem Makers teamspeak, the server IP is: TS.MM-RS.ORG and make sure you use your runescape name! If you need help with any of this go into #Mayhem-Makers IRC channel and PM an operator and ask for help. Pink Team-6 Cape is required for ALL trips ( You can find the seller at Edgeville by wilderness ditch ). - Phoenix Necklaces are HIGHLY recommended. Equip one when you begin to take damage. It will make the difference between living and dying in a fight. - Super antipoisons are optional. - Using saradomin brew and super restore potions will make you tank and last so much longer. - When we say "recommended", it means this gear is the absolute most optimal gear to use for trips and wearing anything other than what is recommended below is a good way to get your application declined. - Use adamant bolts or higher for trips, not diamond bolts(e). Adamant bolts hit the same and are 3x cheaper. If you can afford to use rune bolts, then use them. For hybrids with high range, strength and 70+ magic. For hybrids with high range and 70+ magic, but low strength. For people with high range and strength but low magic. For people with high strength and 70+ magic but low range. Return with the help of the canoe in Edgeville- it can take you to the moss giants at lvl 35 wilderness. Returning is a big part of clan fights. lots of battles are won because our members are dedicated to returning. For example: if it was 60v60, and we killed 40 of them and they killed 10 of us then it is 50v20. But if 30 of them return really fast and our members just sit about scrolling through their banks then before we know it, it is 50v50 again except our side has low supplies and 30 of their members have fresh supplies. Thus we need you to be set up to return fast. You don't need hundreds of return sets, You just need a couple of sets to get you through the weekend and they need to be set up so you can return within 60seconds. See how this person can quickly gear up for p2p or f2p? All of his supplies are on one screen. he doesn't have to scroll for anything. All of his equipment is next to each other so he simply spam clicks his mouse. A setup like this can have you back in a fight within 40seconds. Every second makes a difference. 20 seconds is a century in the tide of war. It is VERY important that you are on TS on trips so you know what is going on and keeps you from getting killed, it lets us function better as a clan. We have recently switched over to TS3, so we DO NOT USE TS2 ANYMORE. When you arrive at that page you will see something familiar to this. Click the big download button. When you have clicked it you will receive a pop up. It'll look similar to this (varies if you use a different browser). After you download open it up and you'll get the install program. Just click next until you finish and then click start to install it. Go to your desktop / Start menu and open Swiftkit. When it opens you should see this. Click Launch Swiftkit and it'll load up and give you your profile options. There will be no "Dev" it'll be only a Default this is just a picture taken off the swiftkit site. Select the Default and click Use Selected. It will open up and you'll get a big screen (just click Play RS near the top right). Now near the bottom left hand side you will see a "Show Internal Utilities" and click on Pac Man. It'll look something like this. Now press connect. Welcome to #Mayhem-Makers IRC chat . Assuming you did everything right, you are now registered with your IRC nickname. Do well to remember your password for this nickname. Obviously, replace password with the password that you chose during the previous steps when registering your nickname. This will log you into your nickname, so you can be added to the Access List of #Mayhem-Makers (meaning you get autovoice), and we'll know that the person on the nickname is actually you and not an impostor. If you need further assistance, contact a leader via Forum PM or any OP in IRC.